A huge part of Jaymun's treatment revolves around receiving his chemotherapy and meds everyday. He also has to have eyedrops put into his eyes every four hours and have "vitals" taken every 1-4 hours, depending on what treatment he's getting for the day. This is where those ever important people called nurses come in. Whatever would we do without them? I depend on them to help me administer all the medication (except for the oral meds, I'm slowly stepping up to help on those!) and keep up on Jaymun's blood pressure and temperature. They're the ones who mediate between the parents and the doctors-which can't always be a pleasant job. When I have a question (and since we're new to all of this, I have a lot of them!) they're the ones I go to. When Jaymun wakes up in the middle of the night with a burning fever or he's in pain from the mouth sores during chemotherapy, the nurses are always right to the rescue. I take my cues from them - I depend on their reactions during these times to keep me grounded when I have to watch my baby suffer from this horrible disease. They assist the doctors with his painful procedures. They are always reassuring and confident in figuring out the best way to relieve his discomfort - and I rely on them to be the anchors for me in Jaymun's treatment. I wanted to point out two nurses who have become an especially bright spot in our days and nights. They are Jaymun's primary care nurses and I'm eternally grateful that we were fortunate enough to get them when we were admitted. Over the five weeks that Jaymun has been in the hospital, we've had quite the large assortment of different caregivers-most are extremely wonderful and others not quite as much. Believe me, when your child is sick and has to stay in a hospital for huge lengths of time, the kind of nurse you get on a shift can really make or break your day! Jaymun's primary nurse on day shift is Nurse Bonnie. I know she occasionally reads this website, so I thought we'd surprise her, making her blush in private by extolling her praises online. Maybe she doesn't know how wonderful she is. Maybe she chalks her nurse duties up to "just doing her job". But she's truly a blessing to me. 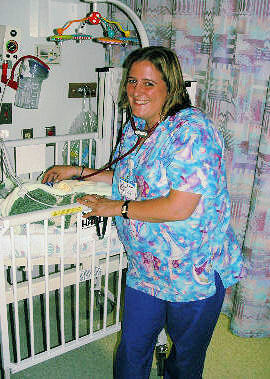 A huge blessing, the kind that makes you wonder what you did right to get such a great nurse! She breezes into our room in the morning, always with a cheerful smile. She lets me take care of Jaymun as much as I want to and doesn't act like I'm an intrusion in her schedule when I try to set the pace for his day. Babies don't have a set schedule like older kids do and there are so many times that his breastfeeding and naps don't coincide with her schedule of taking his vitals or giving his meds. She doesn't make me feel like I'm messing up her routine and I appreciate that. Not all the nurses are so flexible-some of them wake him up, regardless of whether he just fell asleep or not. Others act like I'm putting them out when I ask if they could come back in a few minutes so I can finish nursing him. But Bonnie just treats us like we have a say in what happens and that makes all the difference. Because there's very little about this leukemia that we do have a say in! She takes extra time out just to talk to Jaymun and makes him smile. She even asks me if I've eaten yet and holds him for a few minutes so I can dash out to get some food. (And by the way, that is an enormous bonus-sometimes I only get out of his room for fifteen minutes the entire day!) I just like her, period. She knows all of this anyway, because I try to constantly tell her she's our favorite. But sometimes it's nice to let other people know when a good thing comes your way - and Bonnie is definitely one of our good things!